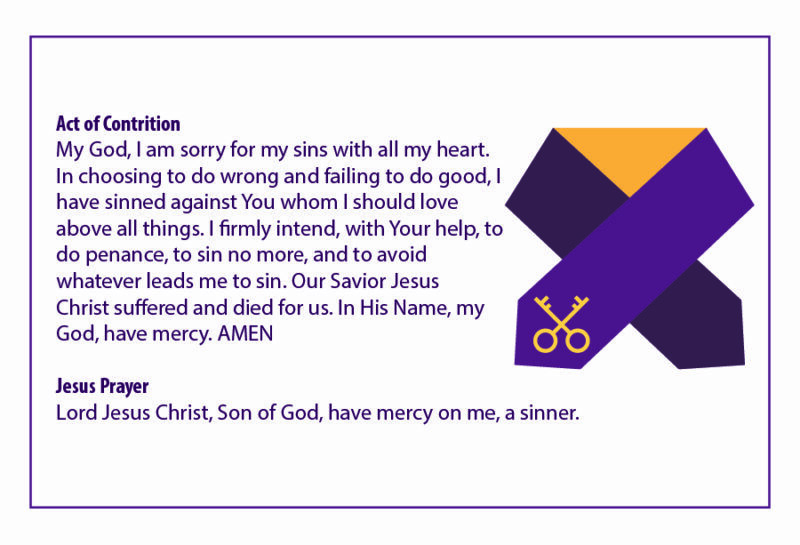 Another prayer that can be read out loud or from memory is called, “An Act of Contrition.” “Contrition” means to feel sad about something we have done, and to feel the need to apologize. Since we were all born with a conscience, we know right from wrong. When we do something we know is wrong, it makes our hearts feel heavy. Sometimes we confide in someone, like Mom or Dad, and it makes us feel better. 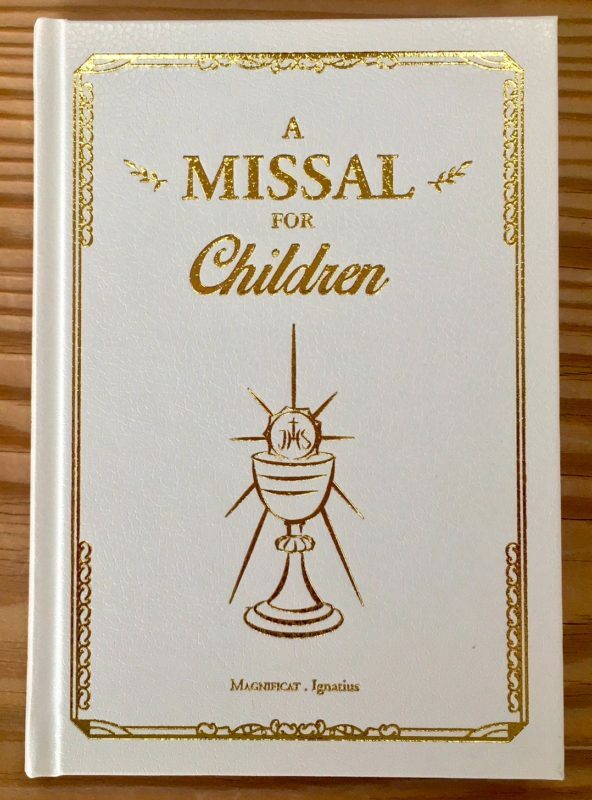 When we make a confession to a priest, the priest has the authority from Jesus, to forgive us and reconcile us to God (re-connect, make whole again) and to heal the broken relationship with God. The priest will give the person who is confessing, a “penance” which is a prayer or a small act to do, such as, apologize to a loved one. The penance is small enough that we can do it, but big enough that it has special meaning. After the penance, the priest will give you “absolution.” This means that you are forgiven and the sin is no longer with you. You can also read or memorize the “Jesus Prayer” on the bottom of the card. The “Ten Commandments” are our guide to whether we have sinned, or not. Easy to do at home with or without a template. Click to print template following printer prompts at bottom of page. Or, provide a large piece of white construction paper and a pencil for the child to trace their hand. Markers, stickers, and a black sharpie are great for decorating easily. Above each finger the child can write in Sharpie: 1. “Admit your sins.” 2. “Be sorry.” 3. Don’t repeat them.” (The child who decorated this added the “it”)! 4. “Tell your sins to a priest.” 5. “Do the penance given to you.” Decorate the poster and hang it prominently for all to see. This graphic design was made by Kim N. Buckley, as is all of the graphic art on SundaySchoolUpdates.com. 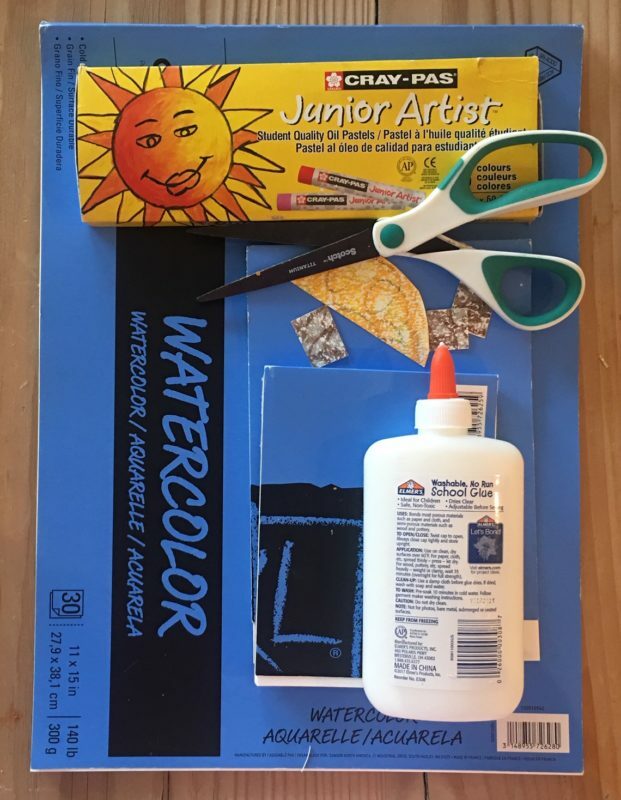 This art project can be done as a watercolor painting, a drawing with crayons, colored pencils, or done as a collage, as I have done here. The oil pastels are fun and fast! 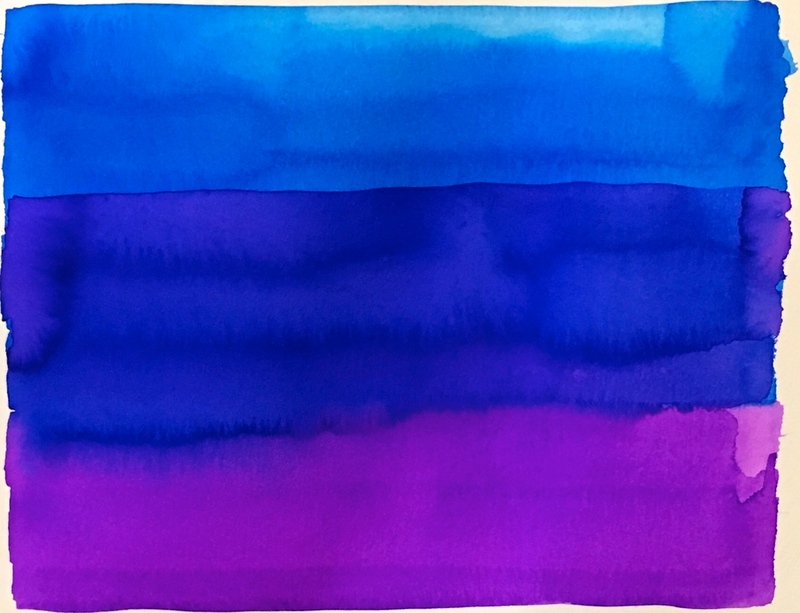 You can make quick shapes and color large areas by taking off the paper on the pastel and rubbing it on its side against the paper. Then cut out your shapes and paste them onto a separate piece of paper. 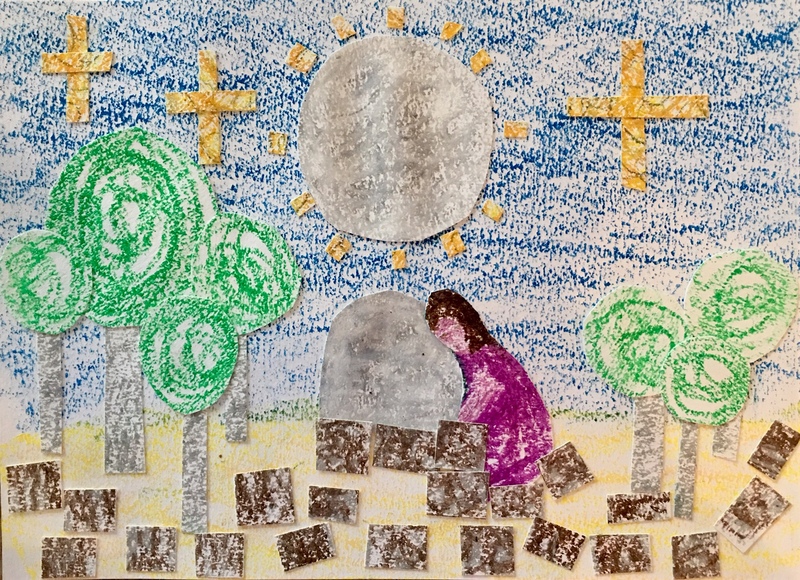 I colored the background first, then added the trees, steps, moon, figure of Jesus, etc. 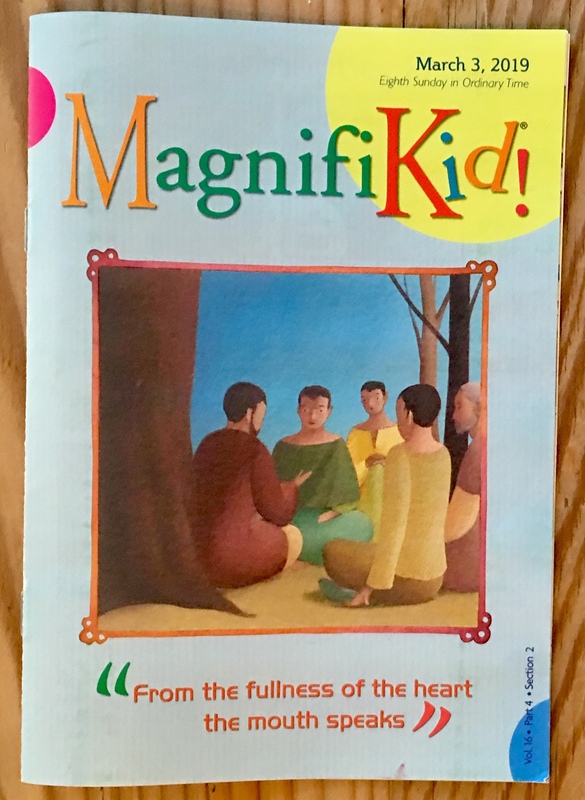 The objective is for the children to imagine the scene and the very sad moment for Jesus. Please read the Bible passage for one of the Sorrowful Mysteries each Sunday for the next five weeks. Help your child name them. “Jesus comes with his disciples to Gethsemani: ‘Stay here, while I go yonder and pray. Jesus sees the sins of all mankind, whose guilt He has taken upon Himself. He sees the wrath of the Father which His sufferings must appease. So great is his anguish that His sweat becomes as drops of blood falling to the ground. An angel appears to Him from heaven to strengthen Him. Jesus is betrayed by Judas, cruelly bound and led away.